Several years ago, I helped out in the tasting room at Pedroncelli Winery. I always marveled at how beautiful the country side was, even on rainy days, and the care that was shown to the land. Four generations of Pedroncellis have tended the land and grown the business even during prohibition when they continued to produce grapes for home consumption. I also marveled at the fact that they always kept their wines at a reasonable price even though they had a reputation for great wines and could have charged more. John Pedroncelli, who was instrumental in building Sonoma County’s wine industry was just two years old when his family moved to Geyserville in 1927 and started making wine. Having graduated from UC Davis with a degree in oenology, Pedroncelli went on to produce 66 vintages at the Pedroncelli Winery and continued to consult for the winery up until his death. Pedroncelli pioneered affordable, approachable wines from the Dry Creek Valley and championed Zinfandel, making California’s first Zinfandel rosé. The Pedroncelli Mother Clone 2016 Zinfandel is a classic Dry Creek Valley Zinfandel. Fragrant aroma of raspberry and red plum with a touch of black pepper and vanilla. Bing cherry and raspberry flavors framed by subtle black pepper spice. Well integrated flavors with round tannins and warm toasty oak in the finish. The August Briggs Old Vine Zinfandel 2014 is a combination of two local historic vineyards and we are excited at the addition of the famed Canard Vineyard for the ‘Old Vines’ bottling. The Canard Vineyard (formerly named Tucker Ranch) is one of the oldest in Calistoga and they source fruit from a mix of vine plantings from the 1920’s and 1870’s! That fruit is added in with the amazing 1906 Luvisi vineyard zinfandel and well… its dynamite in a bottle! The effusive aromas of this wine jump out and grab you letting you know that your mouth is in for a special treat! Dark ruby in color with aromas of raspberry jam, boysenberry, clove and brambleberry. This is what you can call an old style Zinfandel. This is a Zin that will drink tonight but will improve with another 4-7 years of aging. 350 cases produced. All of the elements of this wine are made with the house philosophy (think: bright flavors, focus, energy, good with food), with the overreaching mandate that it is absolutely delicious. The very rough and unscientific formula is this: about a third Bordeaux varieties, about a third Rhone varieties, and about a third other varieties dominated by Zinfandel with a bit of of this or that peppered in to add interesting accent notes. Carignan sourced from a 45-year-old, organically farmed vineyard in Redwood Valley continues to expand its influence in Mordecai, acting as a bridge between the Rhone and Bordeaux lots. 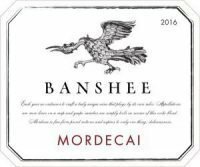 The 2016 Mordecai has an enticing nose of pepper, violets, cigar and cassis. On the palate it is a mouthwatering mélange of red berry and plum flavors backed by earthy tones of herb roasted meat and fresh black trumpet giving way to a spice-laden finish.